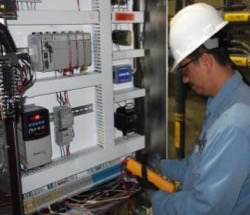 At Technical Diagnostic Services, we are committed to ensuring safety without exception... for our employees, our customers and their facilities. We encourage participation of each individual to govern his or her own work practices and to ensure the safety of others. At a startup & commissioning job site, TDS' technicians found test switches that were wired wrong to the relays. If the customer was to open them with the transformers on, there would have been a catastrophic event endangering personnel and destroying the CT’s internal to the transformers.